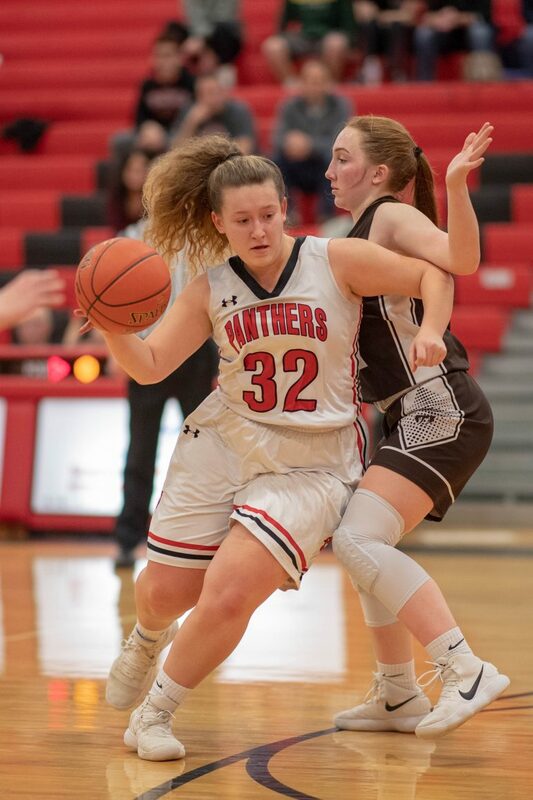 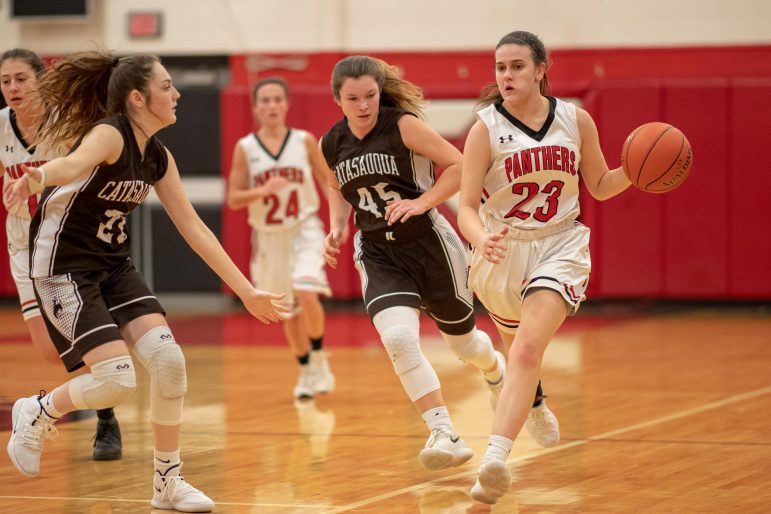 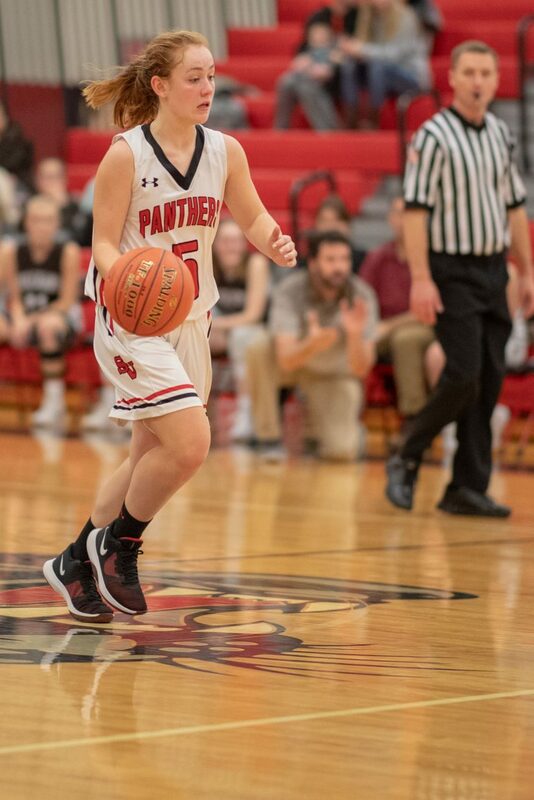 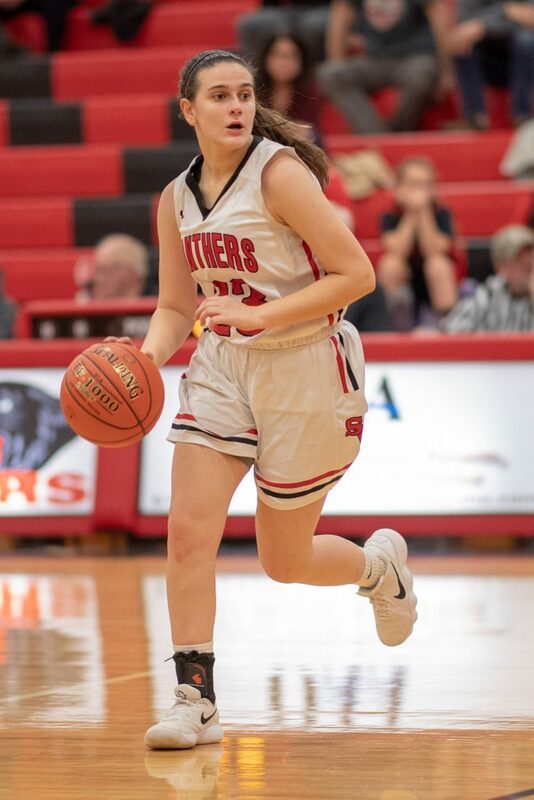 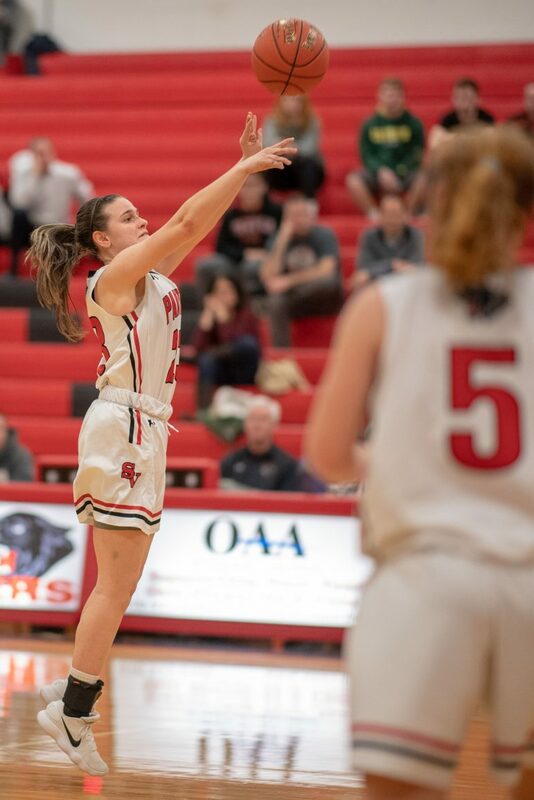 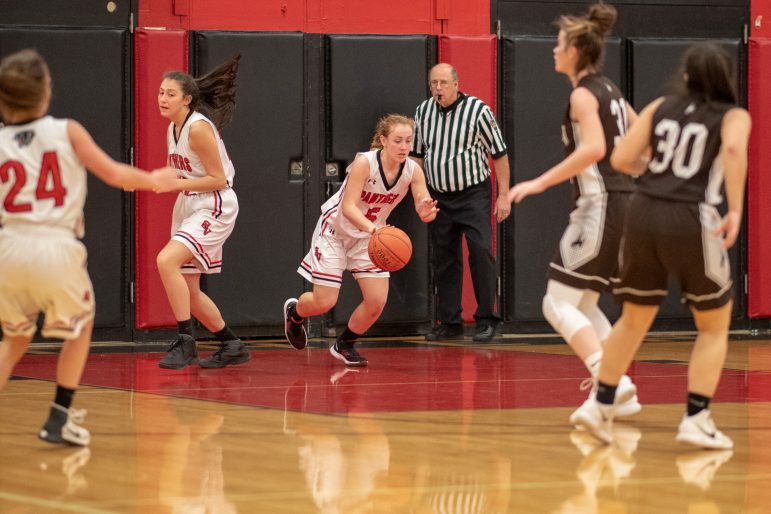 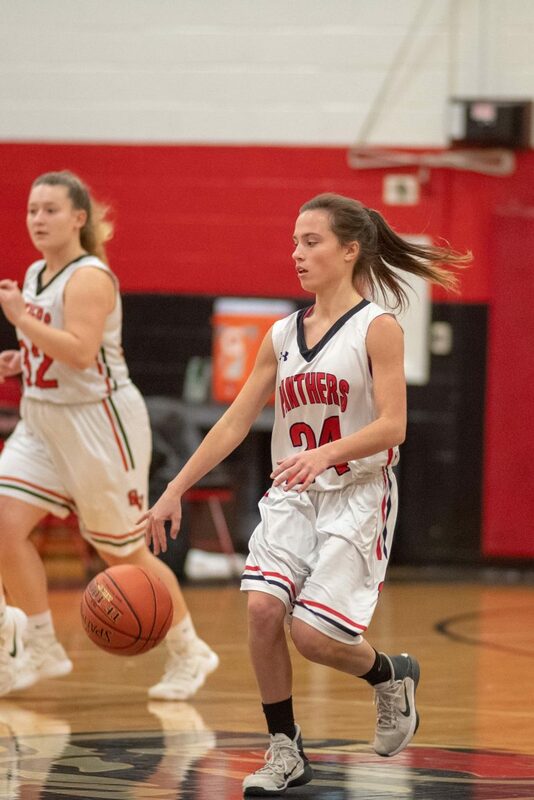 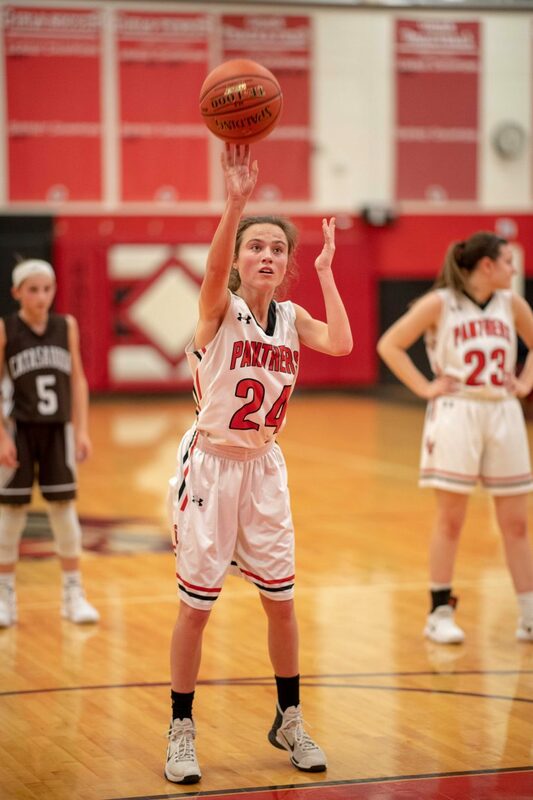 The Panther varsity girls basketball team was able to celebrate its first win of the season Wednesday after defeating the Catasauqua Rough Riders, who were also winless entering the game. 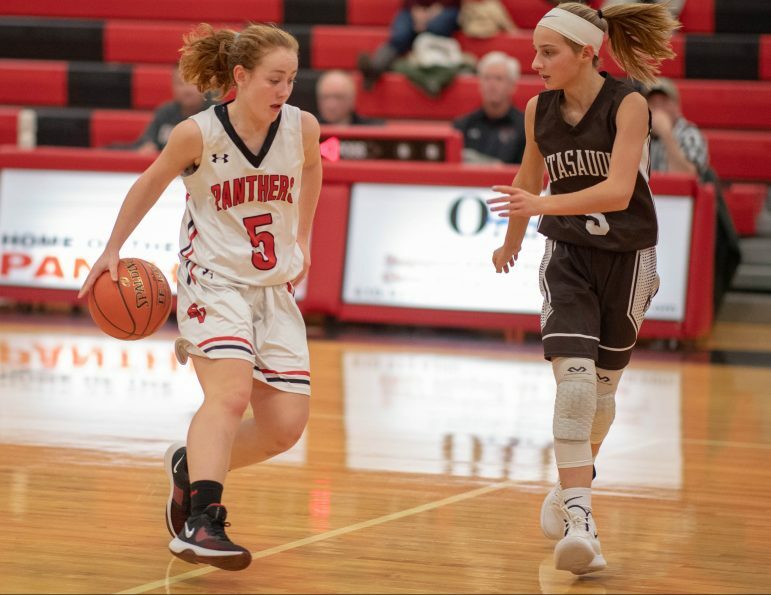 In a battle of two winless girls basketball teams Wednesday it was the Panthers, playing on their home turf, who got off to a good start. 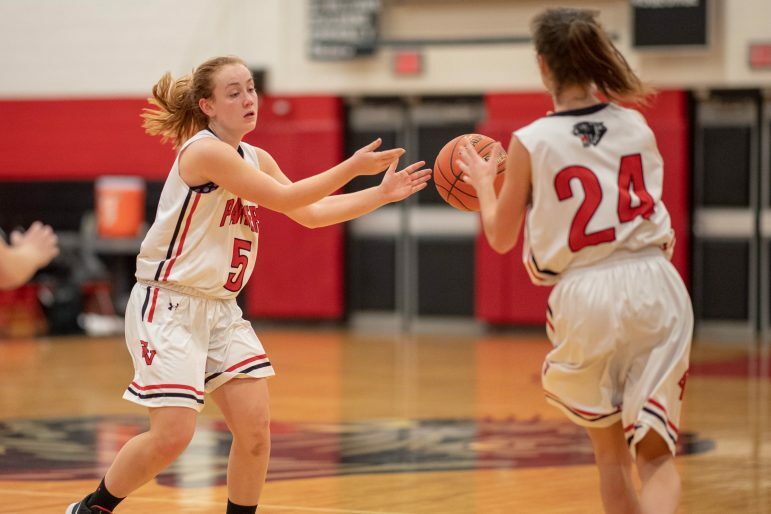 Saucon Valley took care of the basketball and led 14-5 after the first period of play. 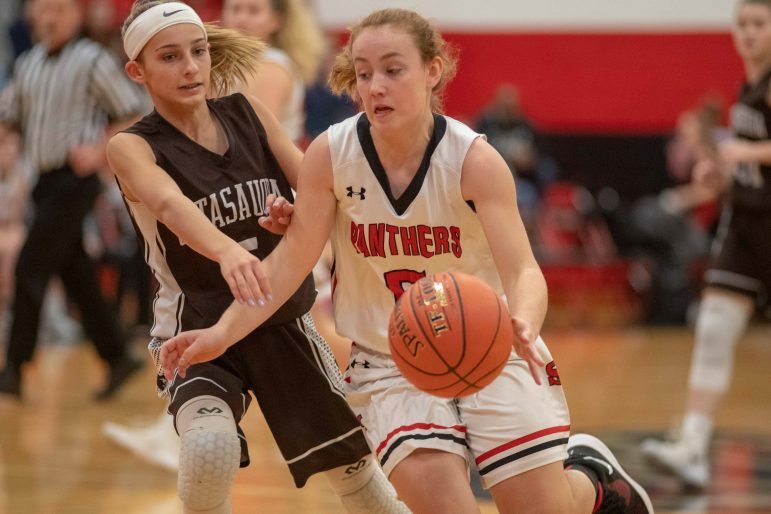 Catasauqua clawed their way back to within three points, but Saucon Valley closed out the second period with a 23-14 advantage. 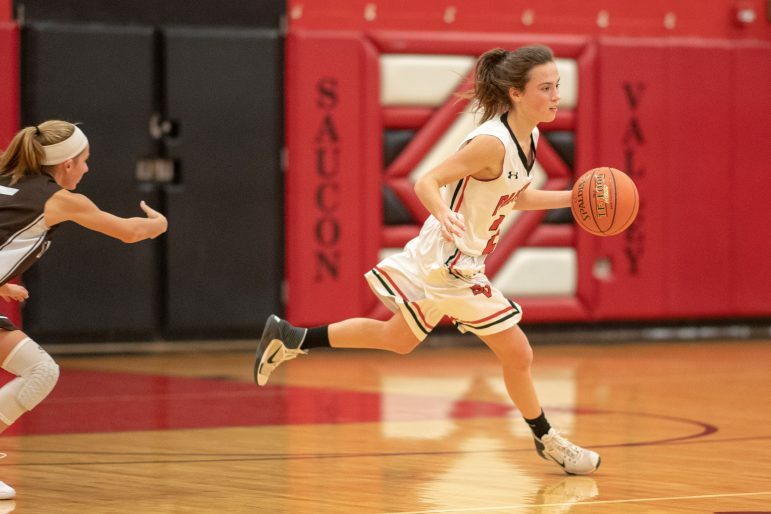 Saucon senior Katherine Naiburg dribbles past a Roughie defender. 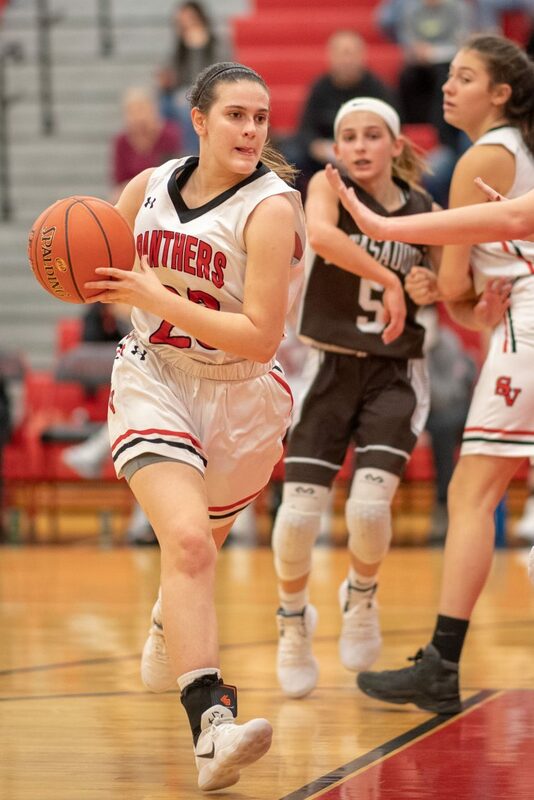 The Panthers, who have not been a very good third period team coming out of the halftime break, gave up 14 points to the Rough Riders and found themselves clinging to a three-point lead as they entered the final period of play. 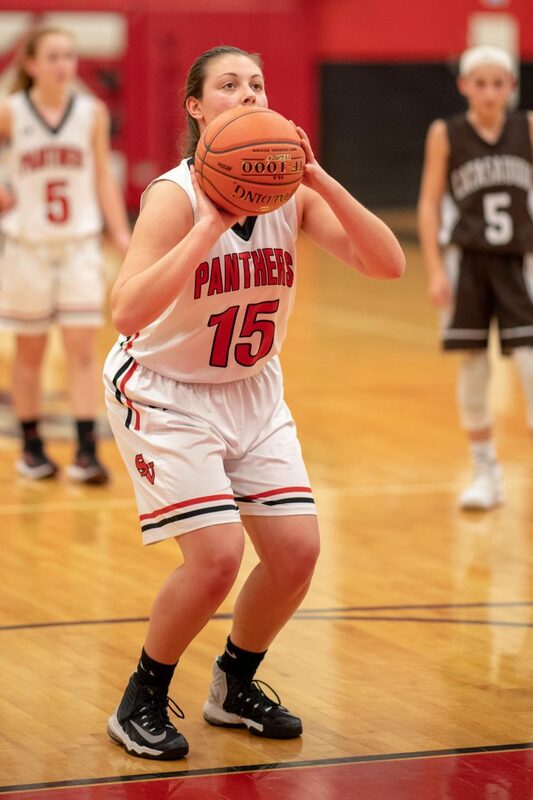 It was tense and it was competitive, but the Panthers never trailed. 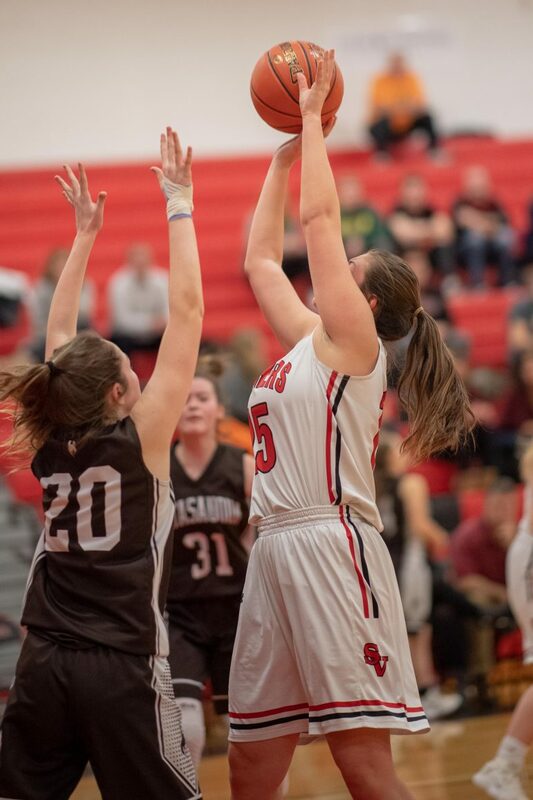 Saucon hit their foul shots down the stretch and finished with a 43-36 victory. 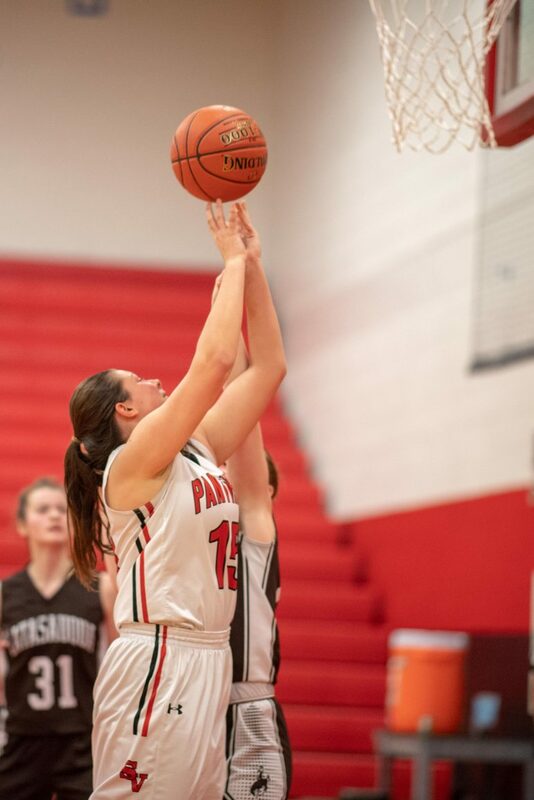 It was Saucon’s first win of the season. 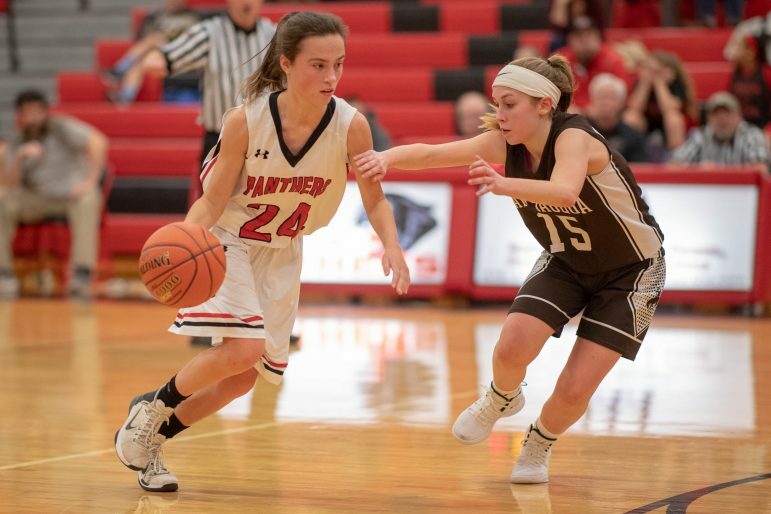 Seniors Katie Kramer and Kiele Riefenstahl paced the Panthers. 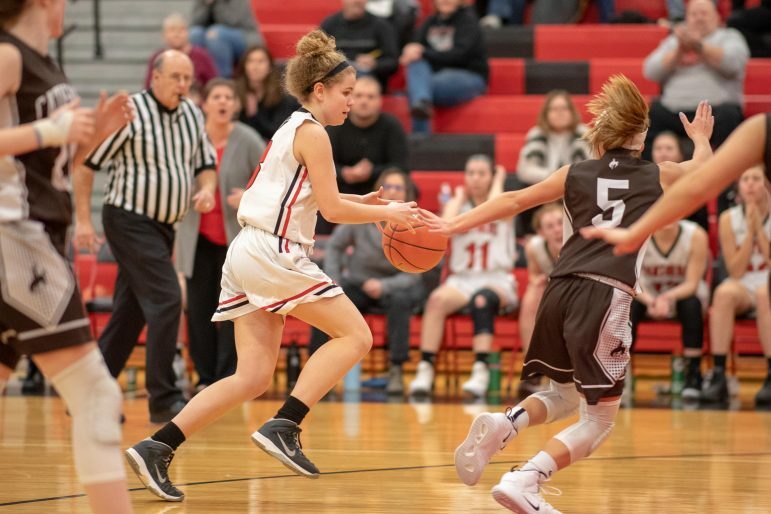 Kramer had 13 points and Riefenstahl added 10. 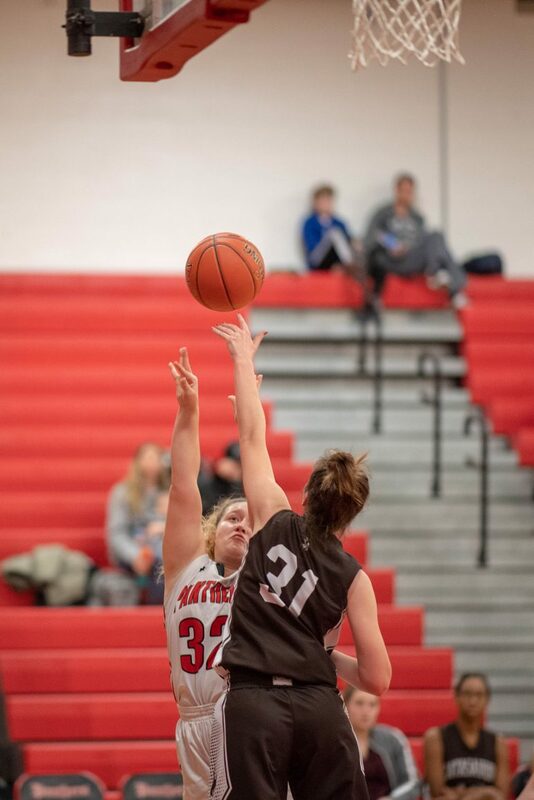 Sophomore Alexa Rushatz had 13 points and senior Taylor Richards chipped in 10 for Catty. 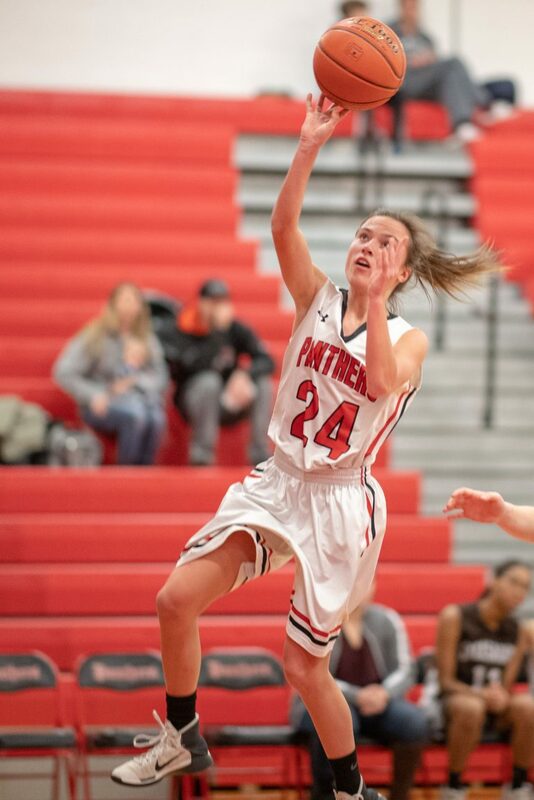 Click here to view the team roster and other stats. 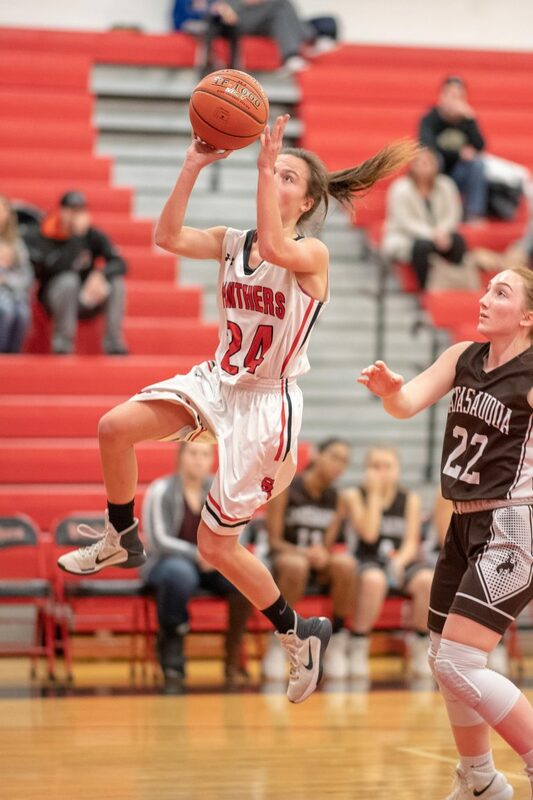 Up Next: The Panthers travel to Notre Dame-Green Pond Friday night to take on the Crusaders. 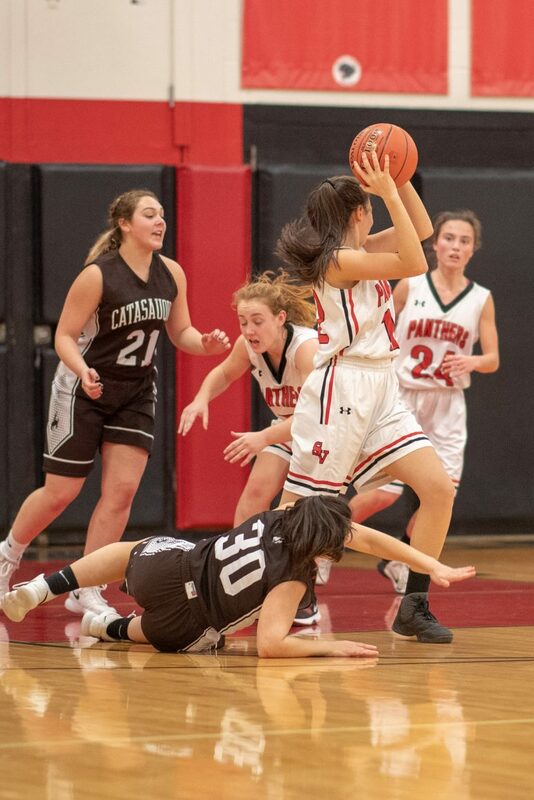 Tip-off is scheduled for 6:45 p.m.
All photos below by Chris Christian. 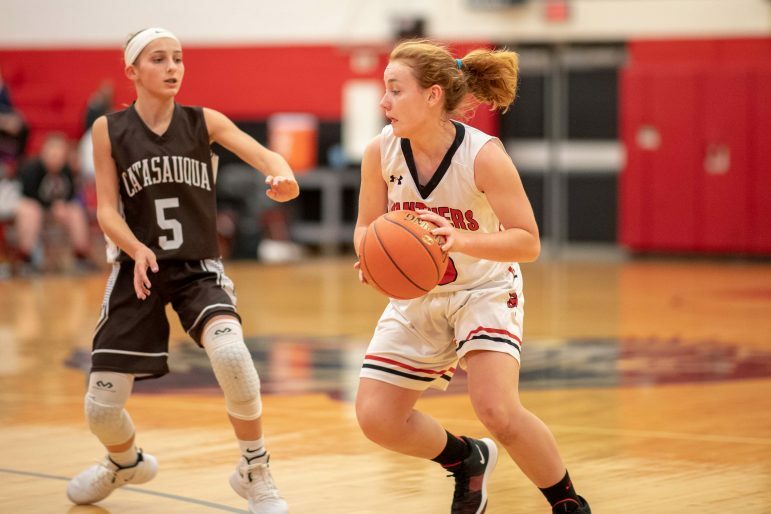 About This Series: Andrew & Sonya Hughes of Hellertown sponsor girls basketball coverage on Saucon Source to help recognize the achievements of female high school athletes in Saucon Valley, and in tribute to their own daughters, who were both stand-out student-athletes at their high school, where they played softball, soccer, basketball and field hockey. 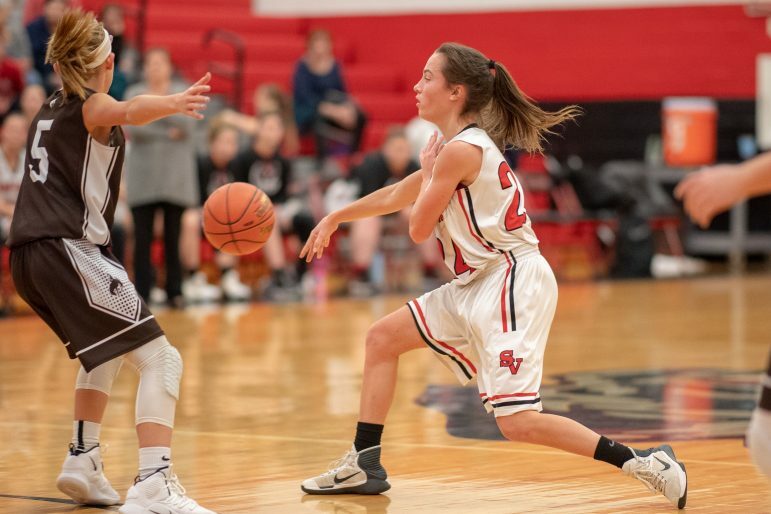 Between the two of them they earned 14 high school varsity letters. 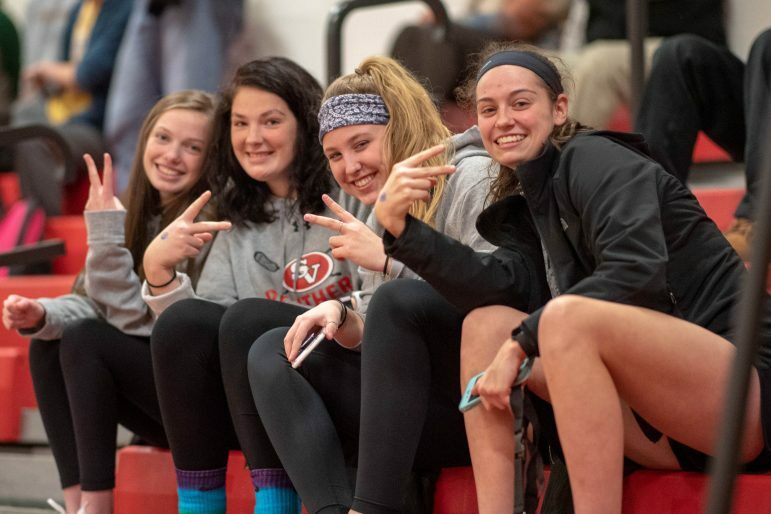 “Female athletics was a big part of our family life for many years, but that journey ended at the high school level six years ago,” Andrew Hughes says. 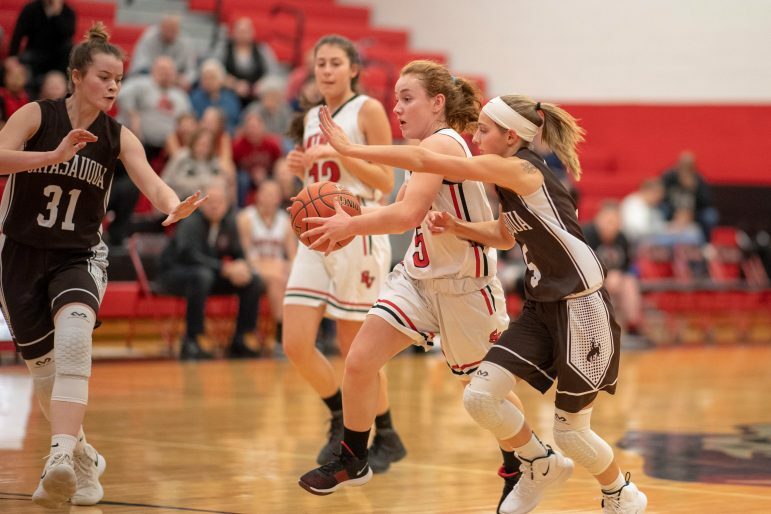 “Through those amazing experiences we also noticed that females don’t seem to have the same level of exposure and support as their male counterparts. 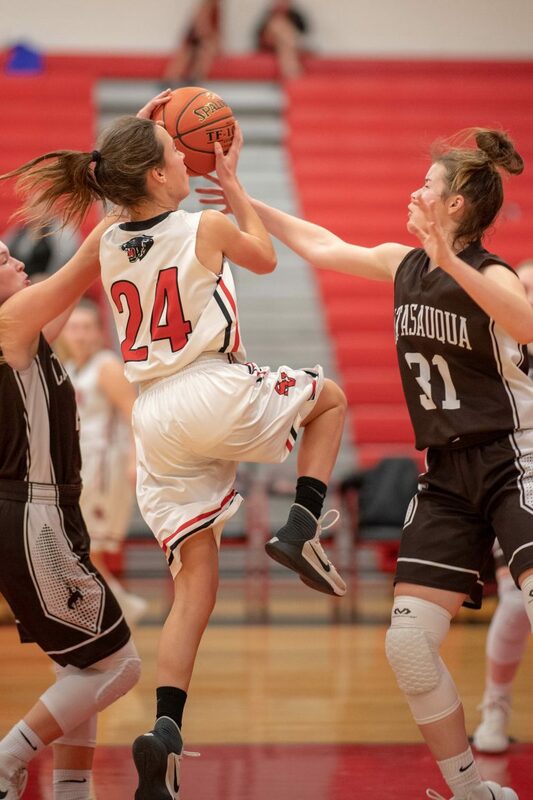 So we are very sensitive to situations where we perceive an imbalance of exposure of female student athlete participation in competitive high school sports. 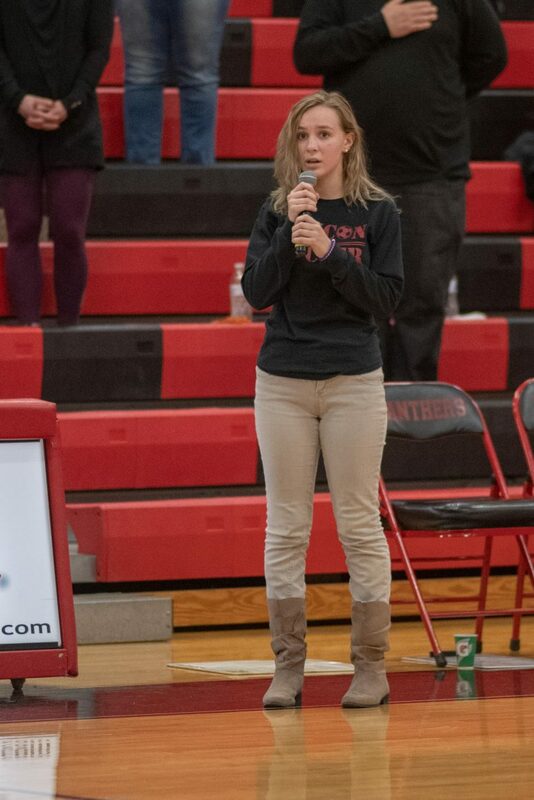 We also like to encourage greater involvement of young people in athletics. 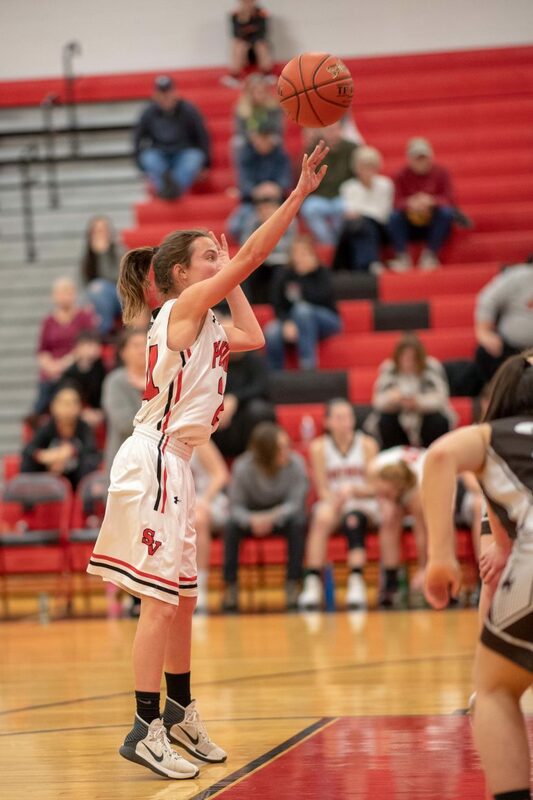 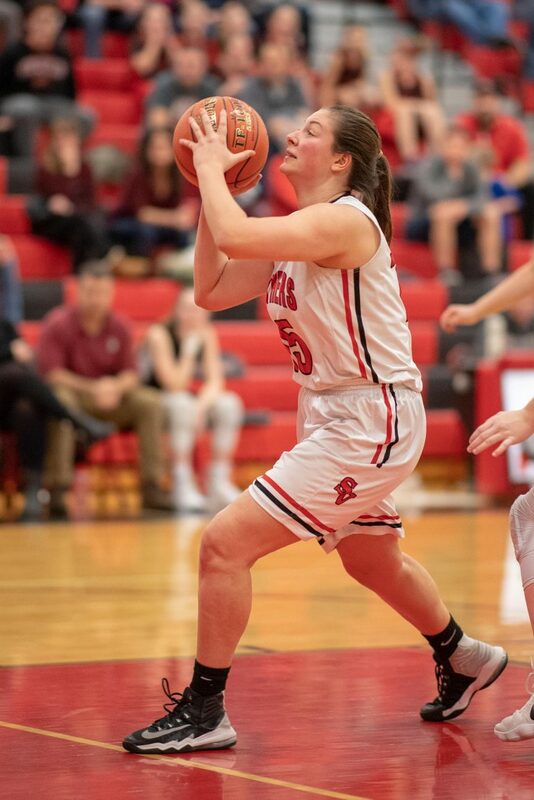 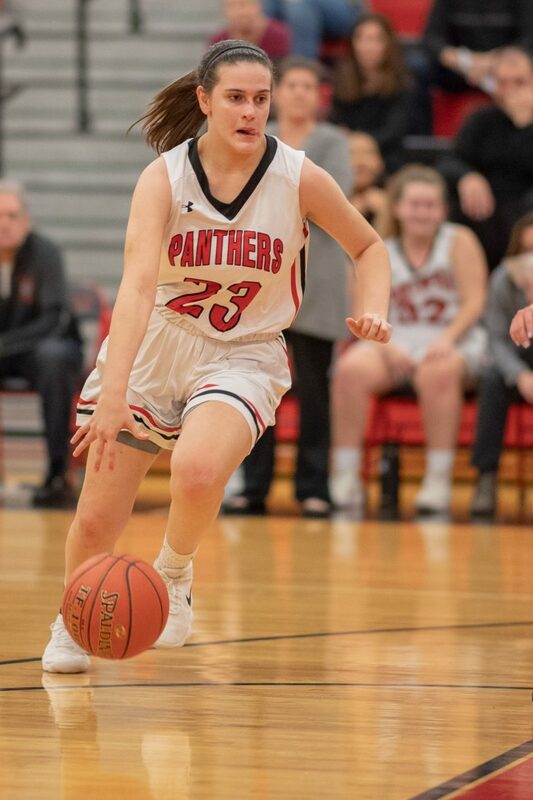 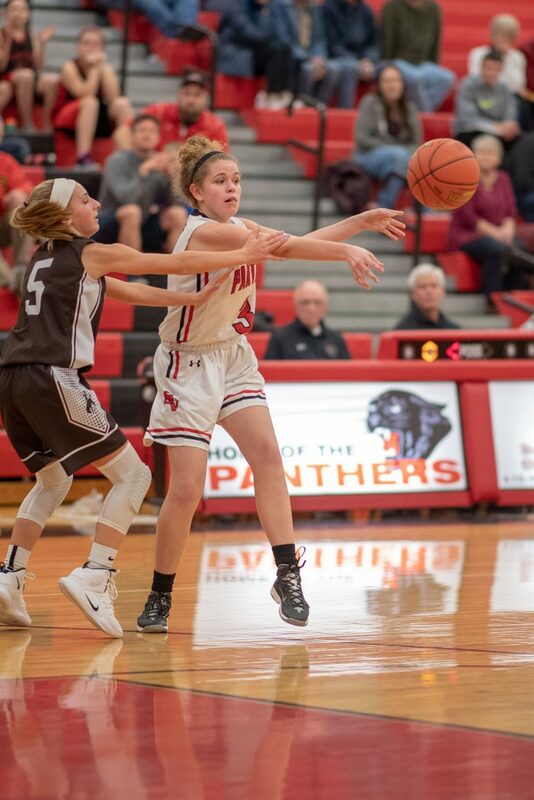 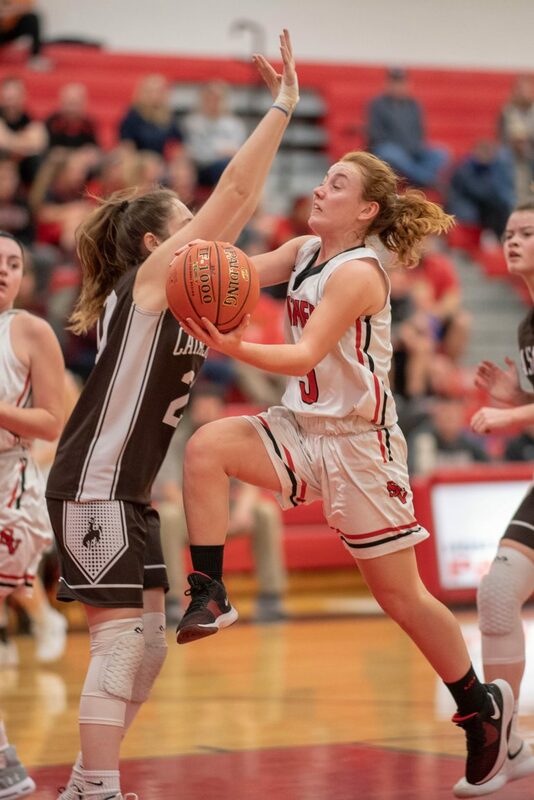 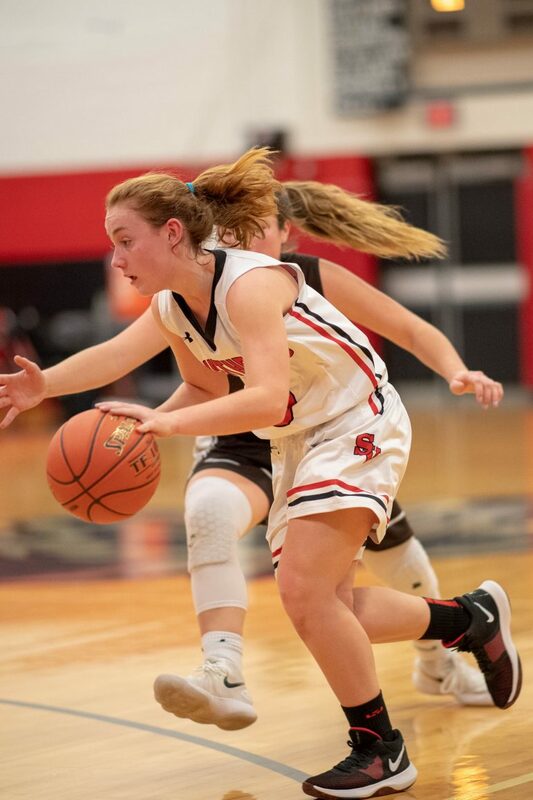 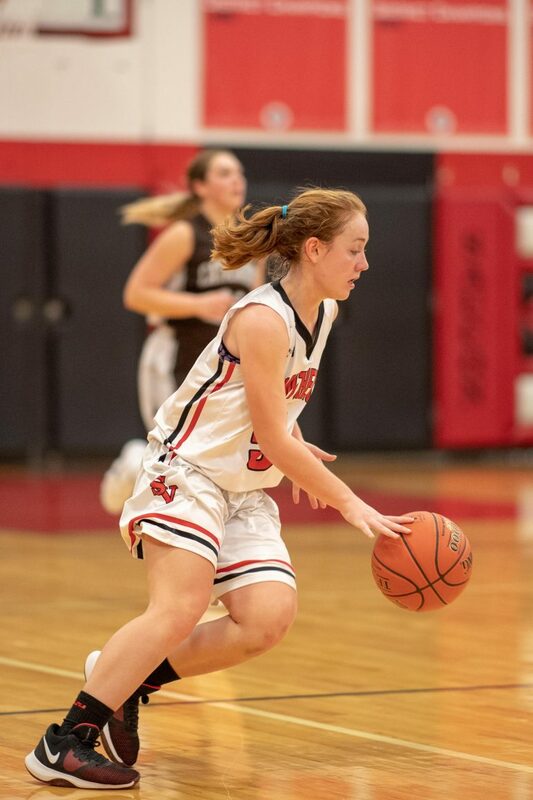 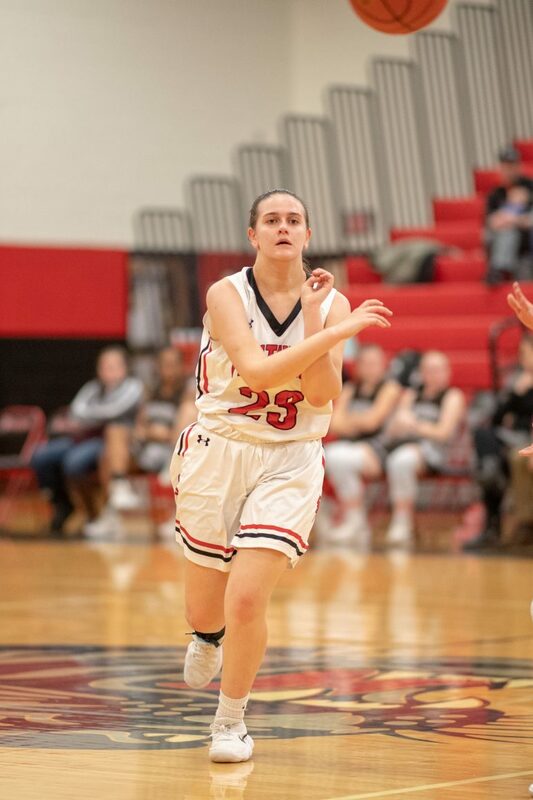 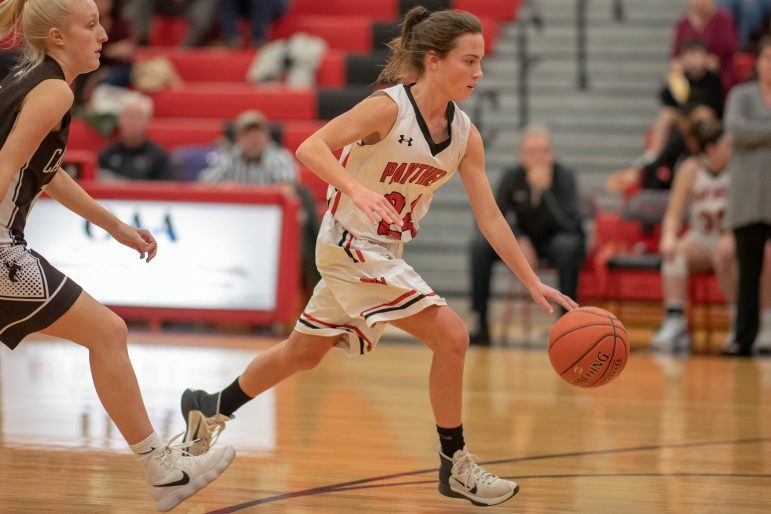 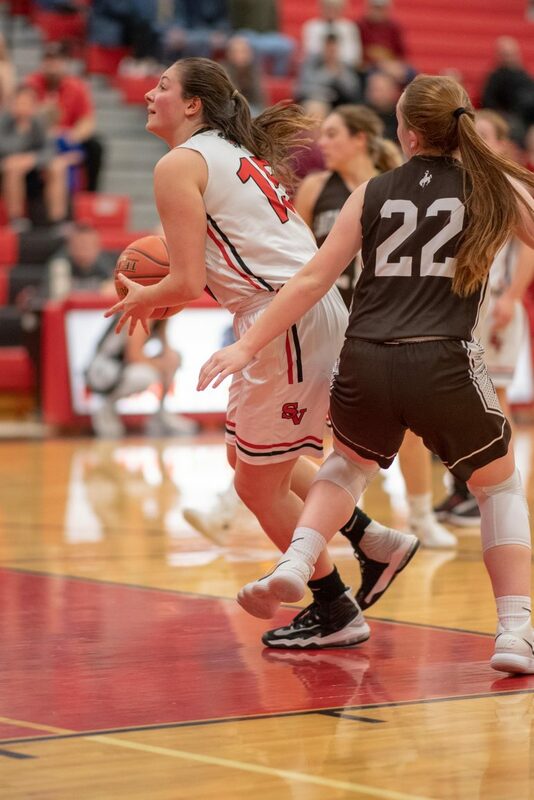 We would like to help the girls gain more exposure at your news source by adopting some girls high school teams.” Saucon Source thanks Andrew & Sonya Hughes for their generous support of local girls high school athletics.